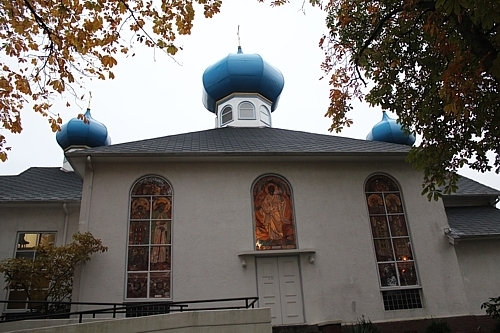 This past Sunday, Holy Apostles Mission Station’s Priest, Father Matthew Francis, had the blessing of serving the Divine Liturgy with the Dean of British Columbia & the Yukon, Father Michael Fourik, at Holy Resurrection Russian Orthodox Sobor, in Vancouver, BC. Father Michael has served as Rector of the Church there for many years, and the community has grown and flourished spiritually under his faithful pastoral care. Holy Resurrection has a great legacy of proclaiming the Orthodox faith in Vancouver, and celebrated its 90th Anniversary this past year. As a new priest in the BC Deanery, Father Matthew was honoured to have the opportunity to serve with Father Michael, and to receive his blessing as Dean. Father Michael encouraged Father Matthew as he begins the Mission work in Chilliwack, which has been established and blessed by His Grace Bishop Irénée. Father Matthew was invited to share with the Sobor community about the newly established Holy Apostles Mission Station, and asked for the prayers of the parishioners of Holy Resurrection Sobor. He also introduced his family members, Matushka Krista, and their son Basil. 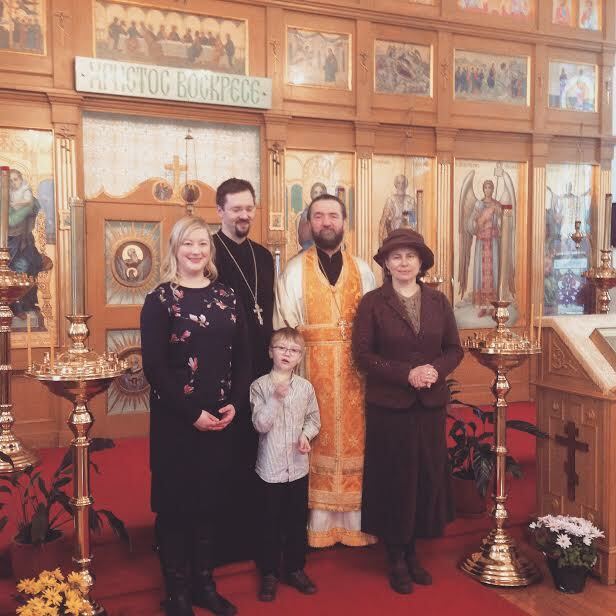 Left to Right: Matushka Krista Francis, Father Matthew Francis, Basil Francis, Archpriest Father Michael Fourik (Dean of BC and the Yukon), Matushka Elena Fourik, at Holy Resurrection Sobor, Vancouver, BC. Father Matthew and Father Michael have known each other for many years, and previously served together on the Archdiocesan Council for the Orthodox Church in America’s Archdiocese of Canada. Deans are appointed by the Bishop in each region of Canada, to assist His Grace in the Administration of the Diocese. They can provide support, instruction, and encouragement to the local parish clergy and faithful. Thank you, Father Michael, for your diligent service and care of Christ’s flock. We pray that God will continue to bless all the parishes of the BC & Yukon Deanery, as they faithfully bear witness to Jesus Christ! ← First Mission Station Services Announced!